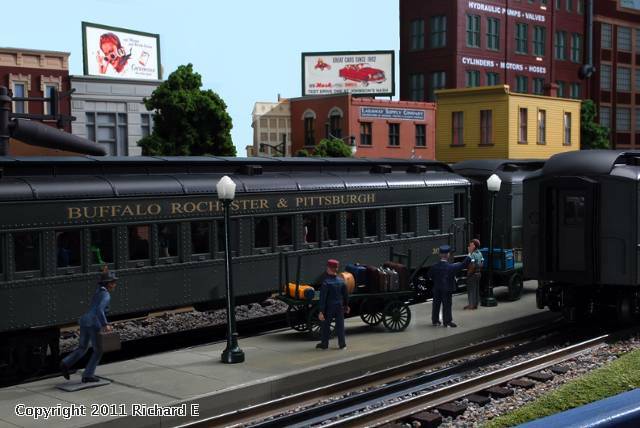 Boarding the morning Southbound Buffalo Rochester & Pittsburgh train. Well Richard, I truly appreciate the well thought out photos you show us here. Of late, you and I have been about the only ones putting up photos for this monthly contest. One recent month went by with no photos at all! I didn't put any up, thinking someone else might. As for me, I no longer have a layout and am running out of post-able photos of my late Baltimore & New York, unless I get on with making another diorama or a portable module or two. I truly hope as you may also, that others can be encouraged to join in here. It would be sad if we lose this opportunity to share. I also am a fan of your work and I am a B&O fan as well. I wish more people would enter photos, I do not want to see this feature disappear. I find sharing photos of layouts inspiring and it improves my modeling. I enjoy photographing my layout, but itâ? ?s been a while sense I took the time to take some new photos. I guess itâ? ?s time to get busy.